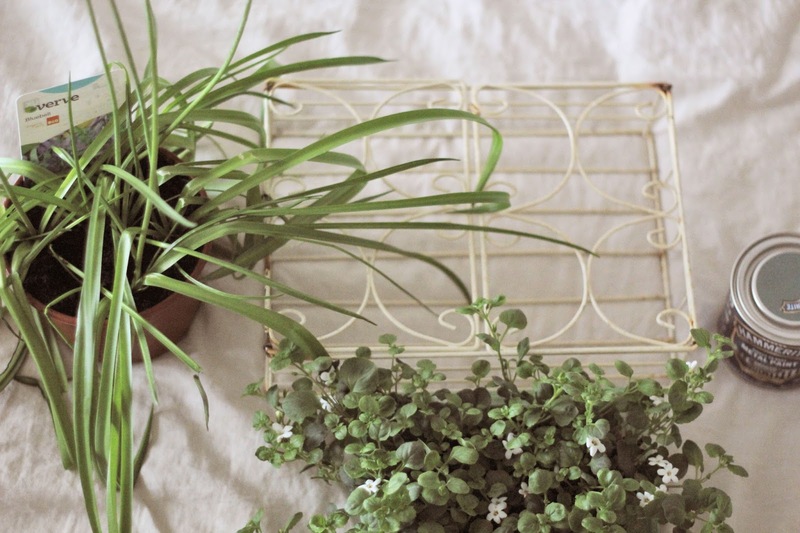 I love to create little feature area's all around my house. My bedroom walls are full of hanging lace dresses, taped up flowers, doilies and book page bunting. My living room has botanical print bunting, flower crowns, beautiful artwork above my record player and a fireplace with woodland creature prints all along the top. When I was asked to review a new app from AkzoNobel called "Outspiration" I was intrigued. The aim of the app is to get you inspired to get outside and make the most of your outside area, whether it is painting your fence or creating a potted plant area out of an old pallet. The app will motivate you to take that plunge by providing you with your up to date weather and a tips and trends section which allows you to watch videos and read information on different types of outdoor decorating. It also has a visualiser section where you can "try before you paint" by allowing you to visualize the colour before you paint. There is also a competition running at the moment on the app to win a beautiful bbq and a personalised hamper worth £100. To enter, all you have to do is download the app and enter your details on the "win" section! The competition is running until the 12th May. To be able to review the app, I was provided with a b&q voucher to gather some items to start my own outside project. I decided to try something different and to stick to my true style. 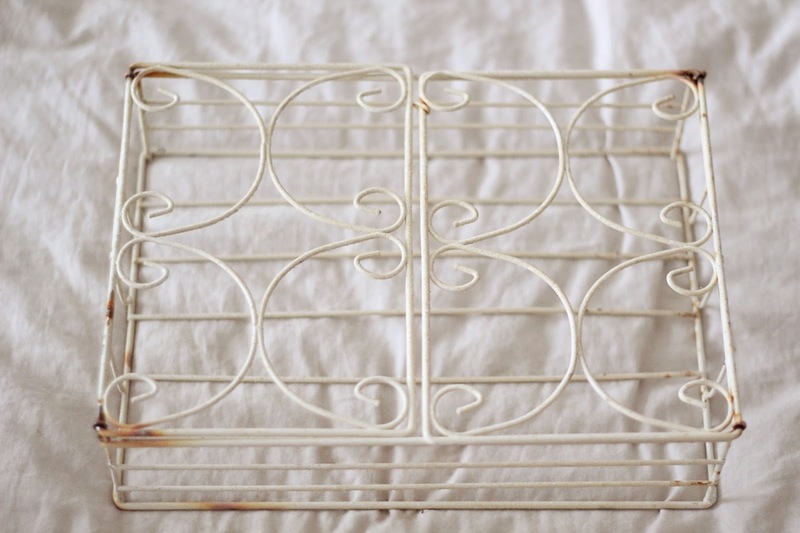 I found an old rusty hanging rack in my parent in laws garden that was just going to be skipped. I took it home with me and pondered on what I could create with it. I took inspiration from my home and decided to create a wall feature. We have a patio section outside our back door that we are in the middle of clearing. Once it is all clear, it will be an al fresco area for us and we would love to have bi-fold doors going out to the garden to bring that little bit of nature into the house. Instead of having a featured wall papered wall like I would inside, i decided to create an interchangeable wall rack where i can add different treasures and flowers for different seasons or occasions. The rack started of a cream colour and normally I sway towards cream but I wanted to push outside my comfort zone and chose a sage colour. We have a rustic looking white wall and I knew the sage would go lovely against it and also with the hanging ivy that is trailing along the wall. I purchased some Hammerite metal paint and it was perfect for the rack. 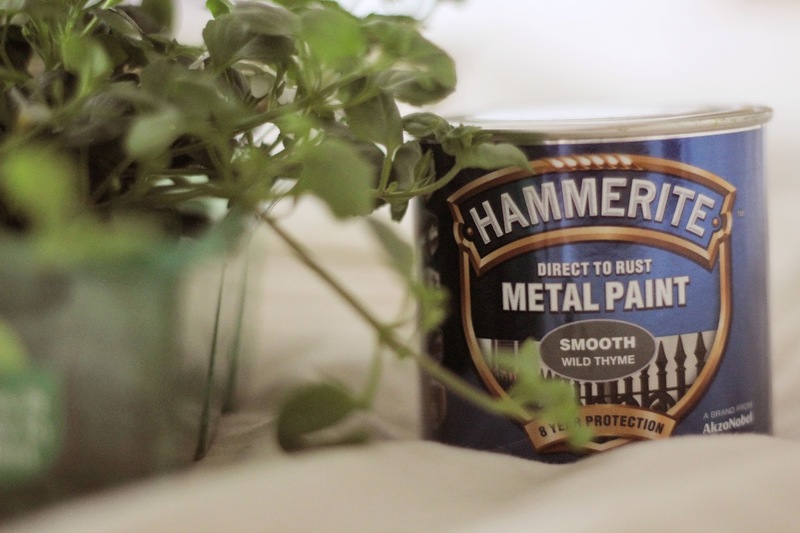 There are different brands of paint for different surfaces so if you were looking to paint a wooden surface, you could choose Cuprinol and for masonry there is Dulux Weathershield. I checked the weather, on the app, for a day in the week where i knew it would be nice and sunny and i sat out on the steps outside, painting the rack. It only took two coats and I was very impressed with the quality of the paint and the silky feeling once the paint had dried. I was really happy with the rack and hung it up. I purchased some bluebells and some bacopa plants with the voucher also. The bacopa plants looked perfect inside the rack. I picked out my favourite mini teapot from my dresser and planted two of the bluebells in there. I picked some lilac from the tree in the garden and put them in a little bottle and I had created the perfect wall feature. 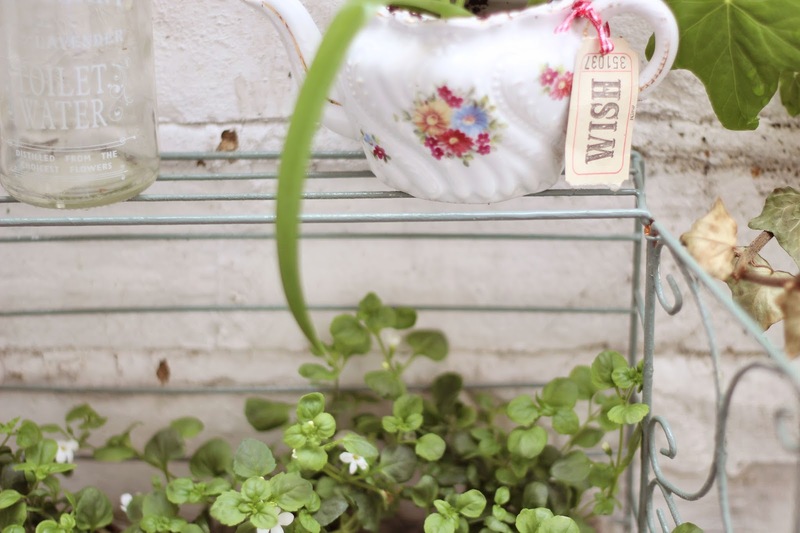 As the seasons change, I can collect and purchase different flowers and plants and i can add fairy lights and tealights for the perfect summer evening dinner parties. 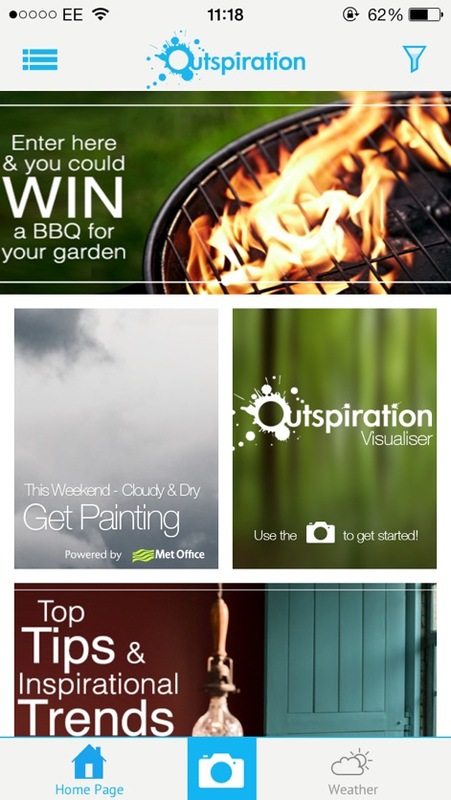 If it wasn't for the Outspiration app, I defiantly wouldn't have thought about creating an outside space like this. 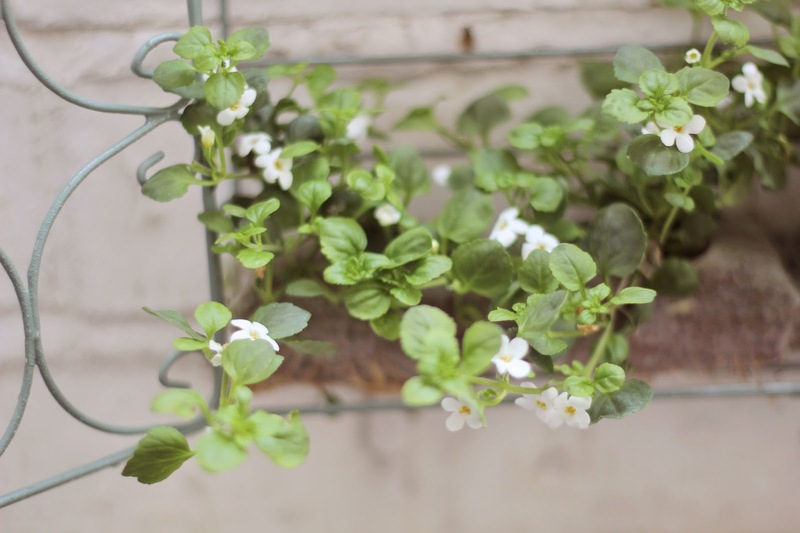 I love planting and I love flowers but everything else my husband does so it was lovely to have a project that I was able to do as a busy full time mother that didn't take long and that we can all use as a family. I like what you did out there , especially the teapot idea. I must try this app. This does sound like a really useful app and I love the feature you have created. 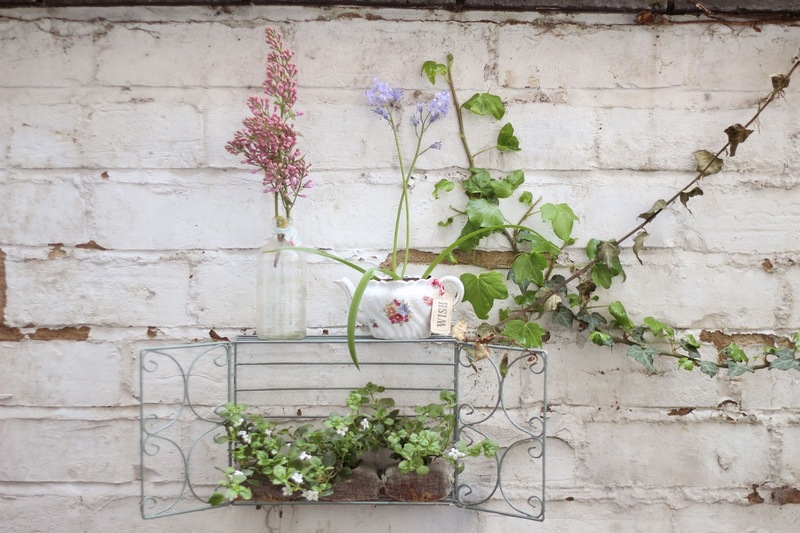 The hanging rack is so lovely, can't believe it was going to be thrown out! Love the result! It looks really timeless and yes, very true to your style. 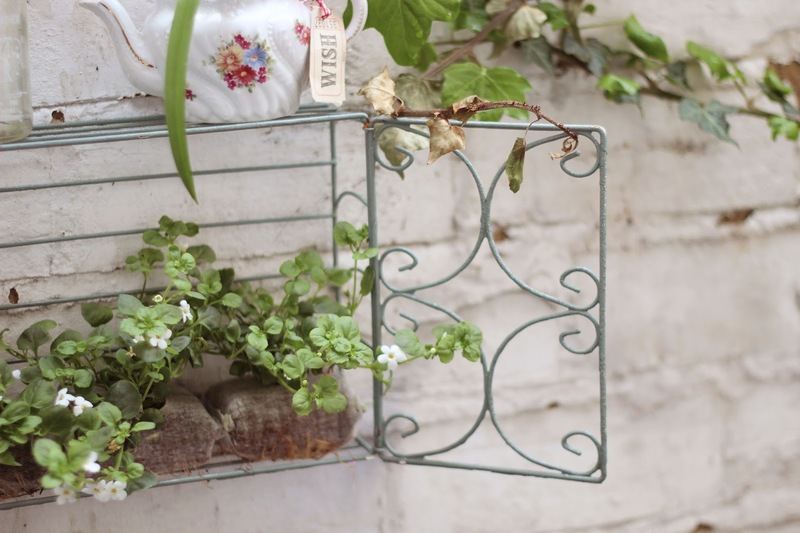 This is such a great idea - we have lots of wire baskets etc in the garage but I have never thought of painting them with Hammerite! What a beautiful display. You really have a knack for design and things that are a little bit different and so wonderfully eye catching. I love the 'Wild Thyme' colour, it is so soothing. It is a great idea to create a feature and I also love that you can adapt it to the passing seasons. This is really really pretty! I love your style! Fantastic! Such a great app - I love your photography.